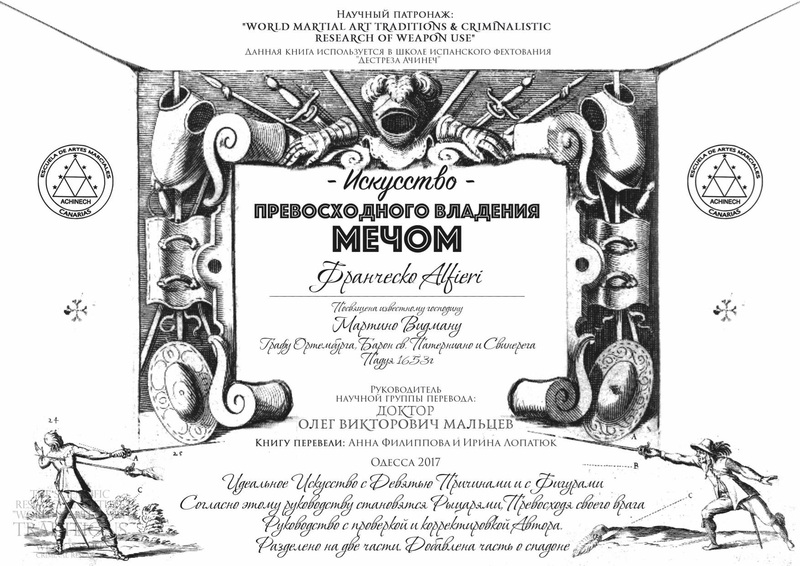 The employees of the “Scientific Research Institute of World Martial Art Traditions Study and Criminalistic Research of Weapon Handling” together with the Spanish Fencing School “Destreza Achinech” translated into Russian language the ancient Italian treatise “The Art of Handling the Sword Well” («L’arte di ben maneggiare la spada») of Francesco Alfieri for the first time. In due time this book has caused a huge delight and became a highly respected book by masters of that days. It is rightly considered as one of the main manuals on fencing today. Francesco Ferdinando Alfieri is a master of a Venetian fencing school from Padua, who lived in the XVII century. Most Italian and Venetian masters of fencing in their documents refer to famous Alfieri as the greatest master. In the treatise “The Art of Excellent Sword Handling” Francesco presented his thoughts about fencing, demonstrated many methods and approaches that are were used in duels, shared his views about the advantages of studying the art of weapon handling, furthermore he told how to make fencing art useful and become the best in this field. The book is written in a manner which passed through the centuries all wisdom of weapon handling. 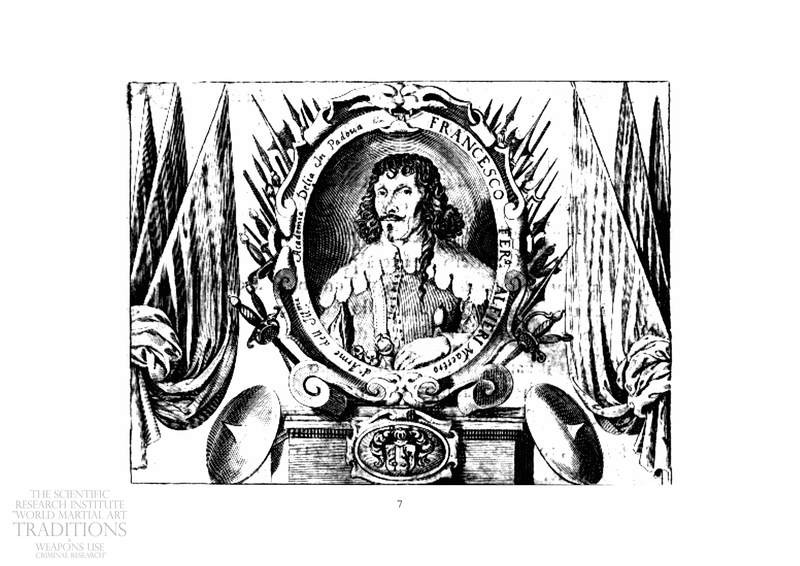 Alfieri wrote it in an unusual language – that is the language of a heart, answering all the questions as “why?” and explaining the principles that completely relieve a person of a fear in a duel. Author as master of fencing who has no equals compiled his practice in this field and tried to convey it in the document. He proposed a new form of a combat position that is different from others, which is called mixed position. He preferred namely this position for both defense and attack. Alfieri broke it into details and described the work with various weapons such as sword, dagger, targa, brokero, kappa, spadone and etc. In this treatise there is a presentation of illustrations with detailed demonstrations of their use in duels. 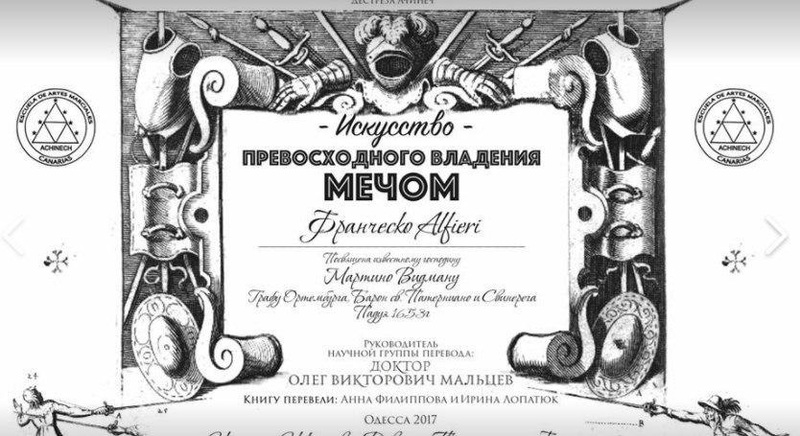 The translation was prepared by the employees of the “Scientific Research Institute of World Martial Art Traditions Study and Criminalistic Research of Weapon Handling” with the guidance of Dr. Oleg Maltsev. The book was translated by Irina Lopatyuk and Anna Filippova.